3 simple tricks to stock research in India for beginners: Hi Investors. It’s been a while since I have written a blog post. This is because I’ve been working on a new project. 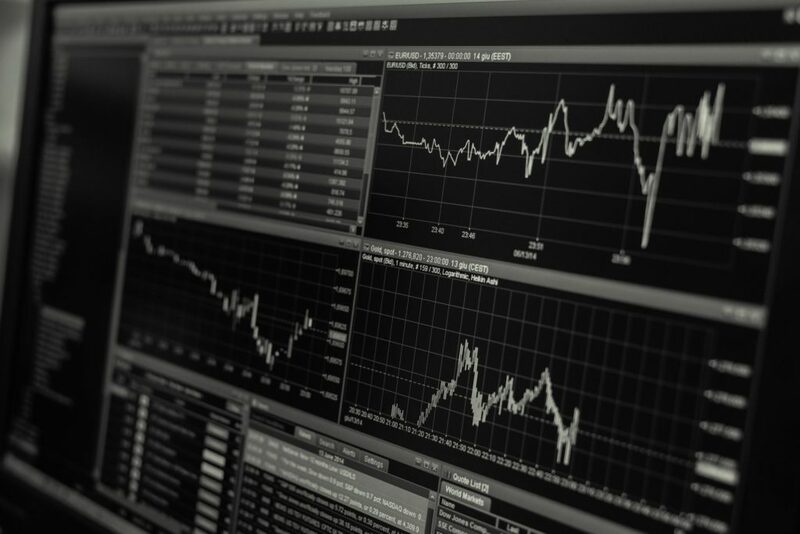 Since launching this blog ‘Trade Brains’ in January 2017, I have received a tremendous amount of emails, messages, and calls concerning stock market investment. 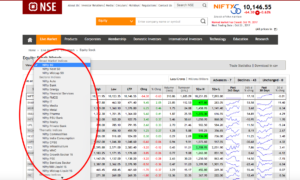 Most of my readers are facing a similar problem- how to pick a stock to invest from a pile of over 5,500 stocks listed in the Indian stock market. Though I have helped most of my readers, who have asked this question; however answering the same question, again and again, is little tiresome and mundane. Further, as this is a big topic, it took lots of hours to explain the same to every individual. That’s why I created this video course on how to select stocks to invest in Indian stock market. Earlier I decided to include this post- ‘3 simple tricks to stock research in India’ in my course module. 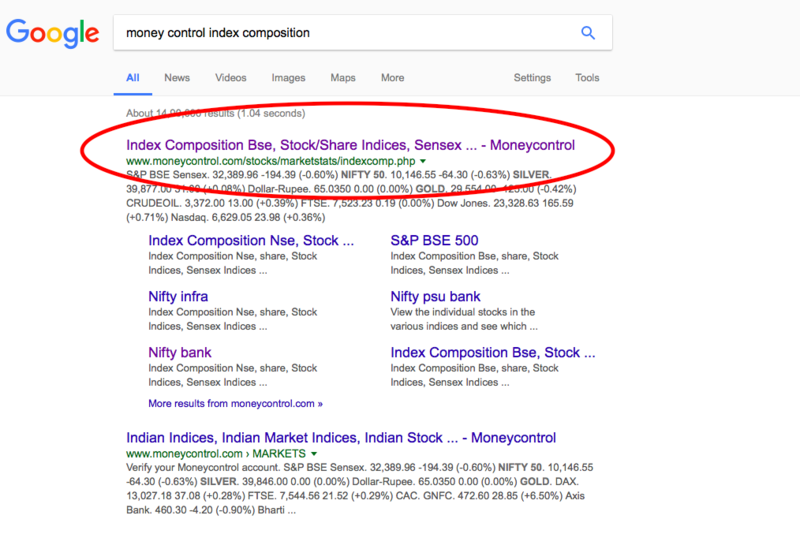 However, I felt that this content deserves to be publicly available on my blog as it can be quite helpful to the beginners to start stock research in India. 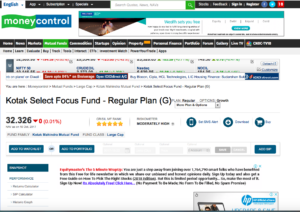 In this post, I will show how you can research good stocks in India to invest in using three simple implementable tricks. So, let’s get started. 1. Money control- Index composition. If you want to investigate the stocks in a given industry/sector, why not to start with the market index composition of that sector. An index composition of an industry consists of all the top companies that are included in that index. For example, if you want to invest in a company in the metal industry, you should first start by investigating the stocks in the market index- S&P BSE Metal or Nifty Metal. 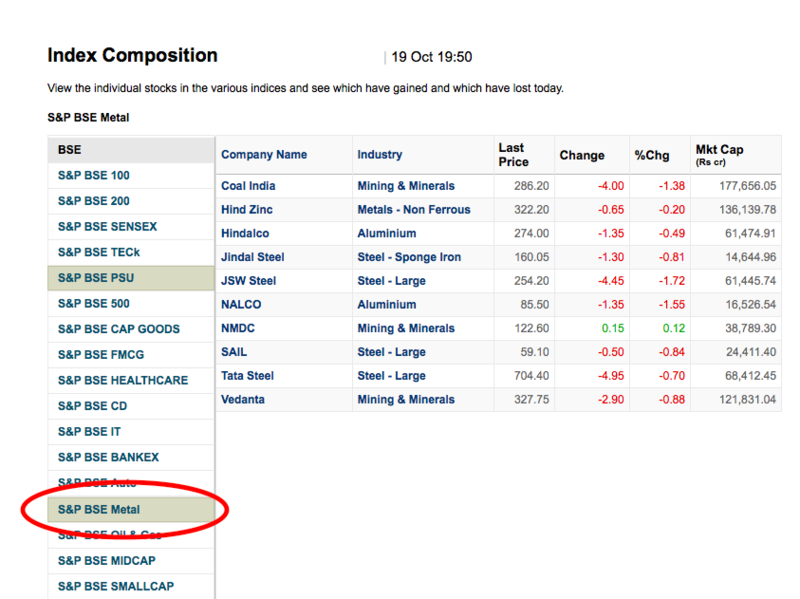 Here S&P BSE Metal consists of companies like Hind Zinc, Coal India, Hindalco, Jindal Steel, JSW Steel, NALCO, SAIL, etc. The index composition will give you a list of companies that you can investigate further in the industry. Now, there’s a simple way to find out about the index composition of the different industries (Capital Goods, FMCG, Healthcare, Banks, Auto, Energy etc). 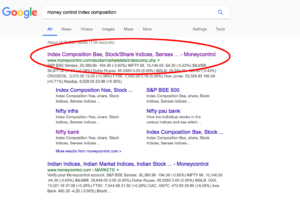 Either you can search for ‘money control index composition’ on google and click on the first link. This will open the money control index composition page. 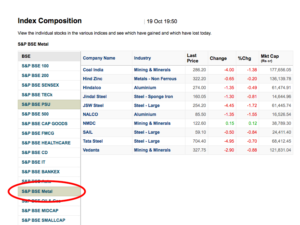 Or, you can directly visit the index composition linked here. On the same page, you can navigate through different industries to know their composition. 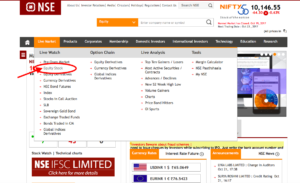 Further, you can find the same information on NSE India website. 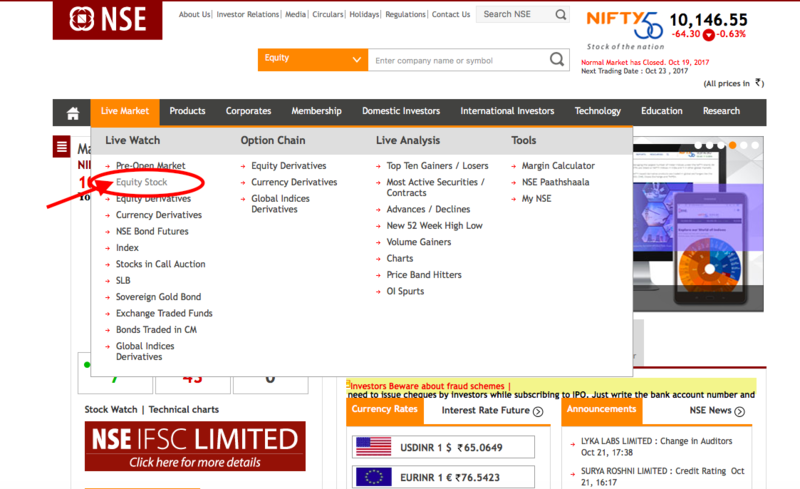 Go to NSE India website (https://www.nseindia.com). 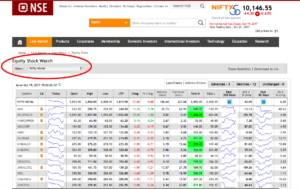 Navigate on Live Market-> Equity stock. Change the view to find the composition of the specific index. Select the industry which you want to investigate. 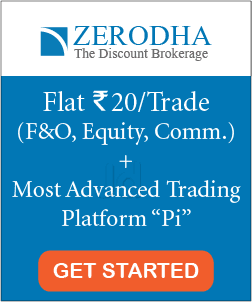 This is the easiest way for stock research in India. 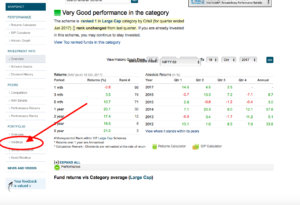 Just look at the portfolio of the top mutual funds and find out its holding stocks. If the mutual fund is performing good, then the chances are that its top holding stocks will also be doing good. 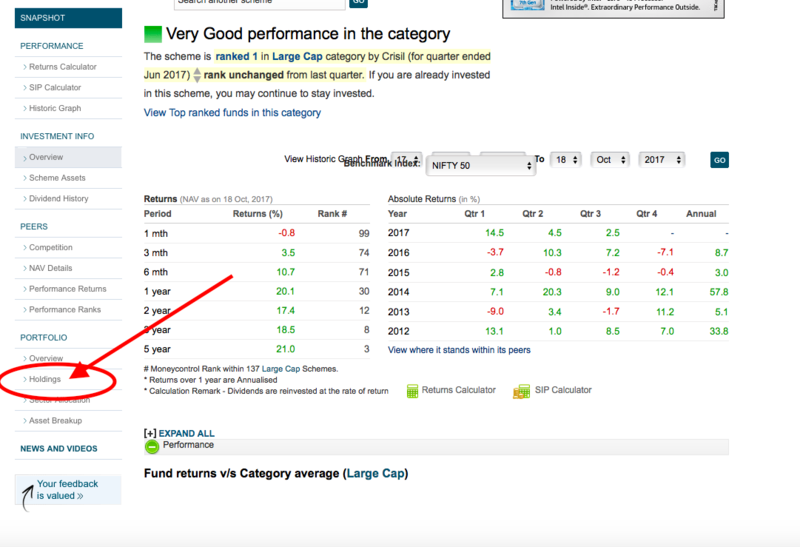 Check the portfolio of few of the top ranked mutual funds in India and you can get an idea of the portfolio allocation for stock research. Now, the next question is, where can I check the portfolio of top mutual funds? 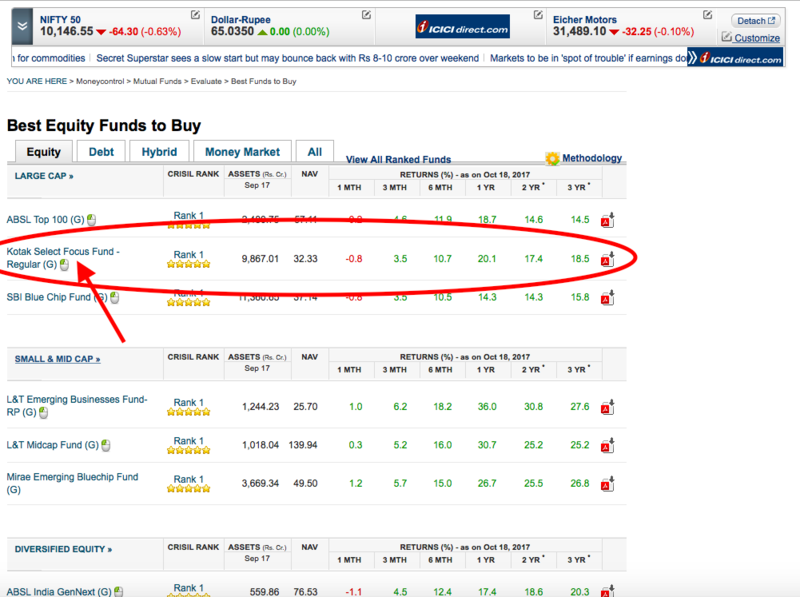 The answer is- there are a number of financial websites where you can find the details about the mutual fund portfolio. 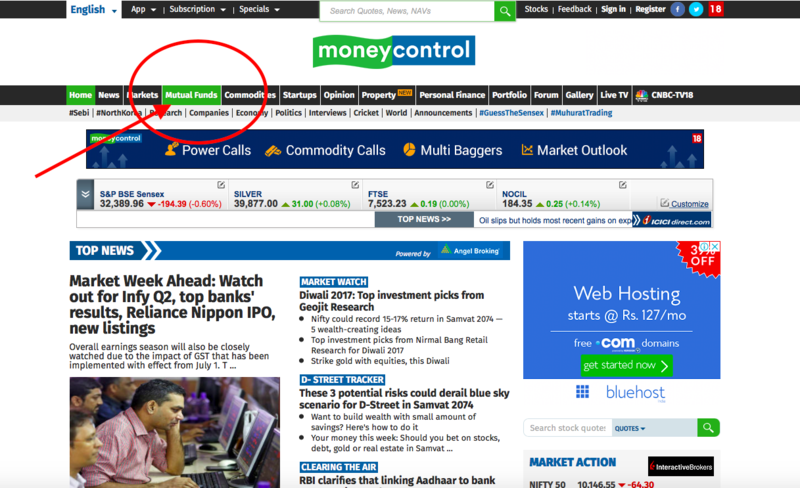 For example- Value research online, Money Control, Economic times market etc. 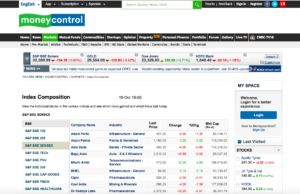 However, in this post, I’m going to describe how you can find the portfolio of the mutual funds on money control website. 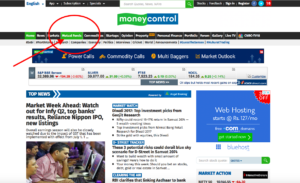 Go to money control website. 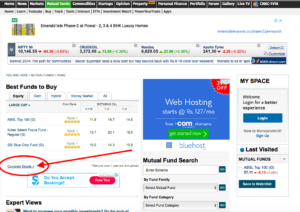 ‘Best Funds to Buy’ page will be opened. Click on ‘complete details’ link. 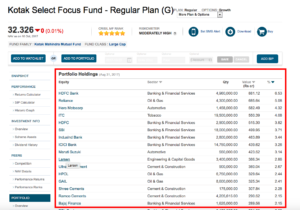 Select the fund whose portfolio you want to check. The fund home page will open. 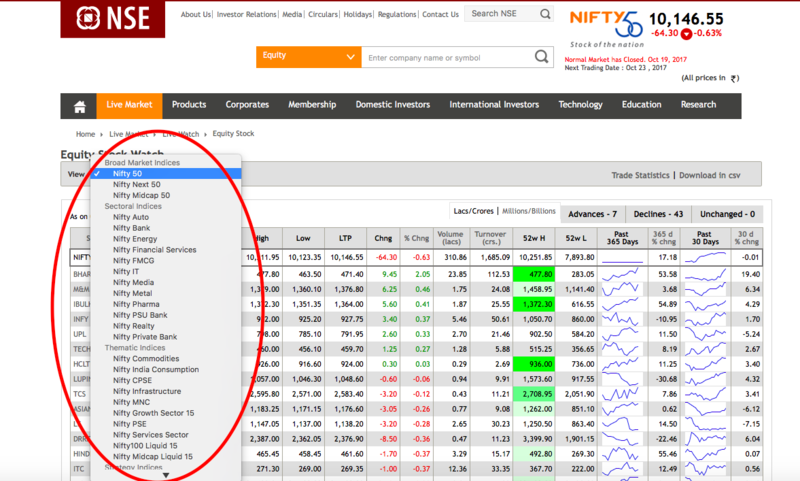 Navigate down and select ‘Holdings’. Portfolio Holdings will be shown. 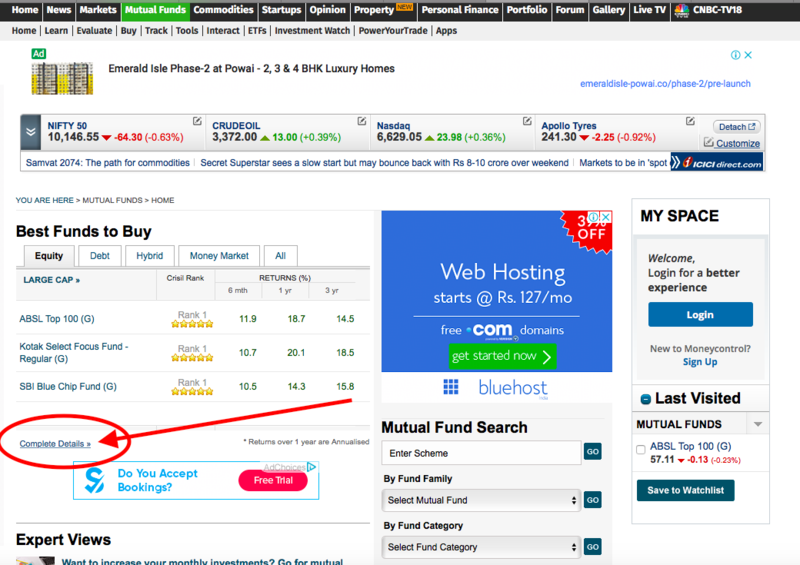 Similarly, you can check the holdings of different mutual funds that you are interested in. 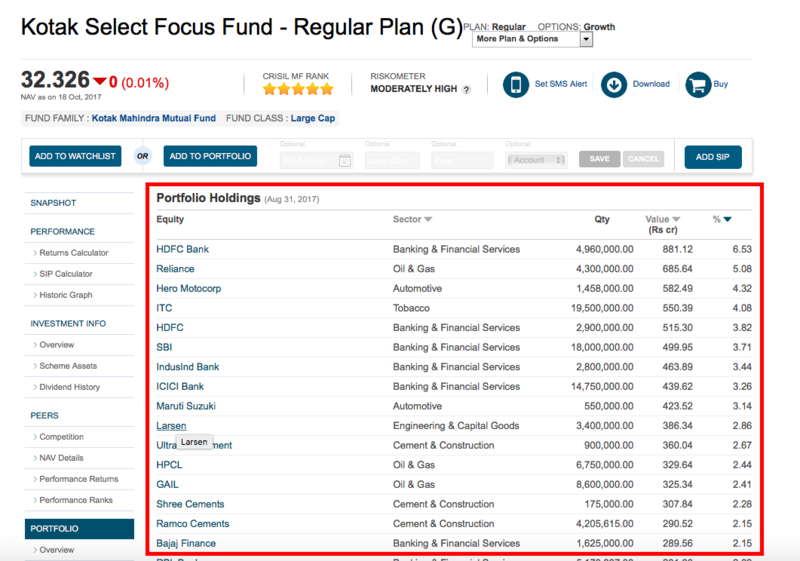 Studying the holdings of the top mutual funds is the simplest way to stock research in India. 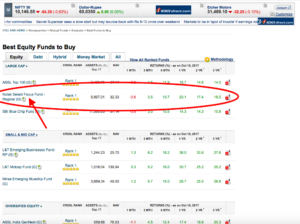 In short, if you do not know where to start, which stocks to investigate; then start with investigating the holdings stocks of these top ranked mutual funds. 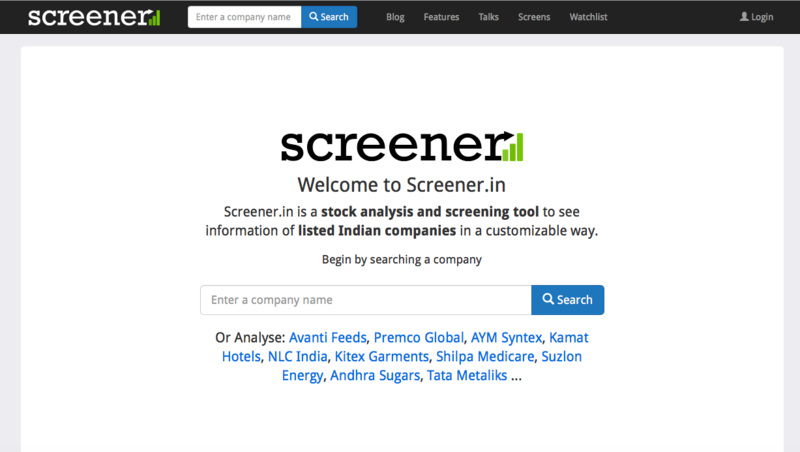 Screener.in is a stock analysis and screening tool to see information of listed Indian companies in a customizable way. 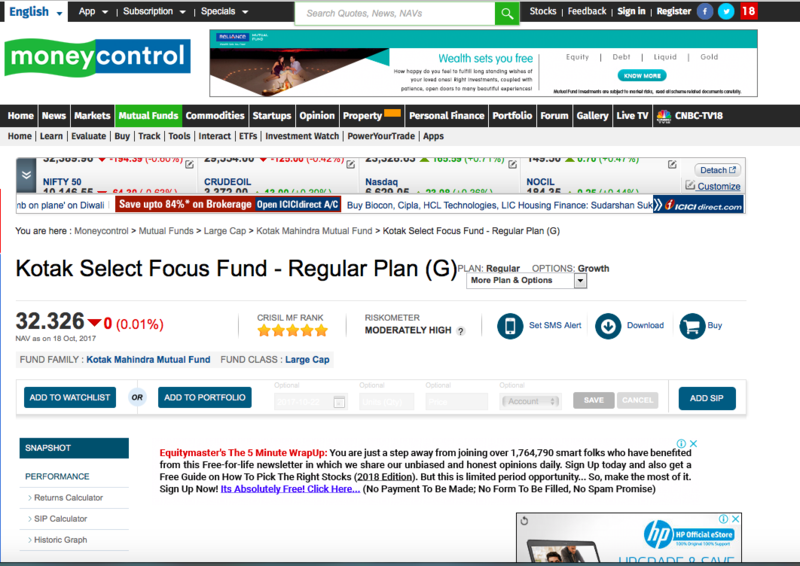 This is one of the best websites for stock research in India. 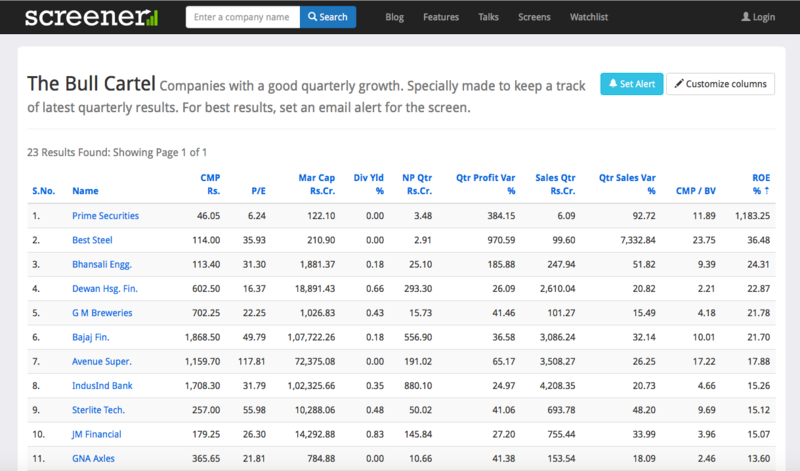 Screener gives you the facility to screen various stocks based on different criteria like growth, dividend, PE etc. 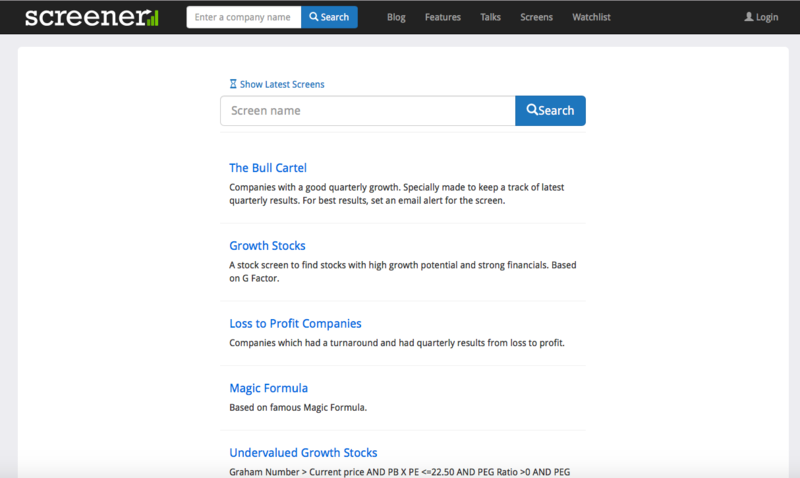 You can find the list of stocks based on different screens like- ‘The Bull Cartel’, ‘Growth Stocks’, ‘Loss to Profit Companies’, ‘Undervalued growth stocks’, ‘highest dividend yield share’, ‘bluest of the blue chips’ etc. 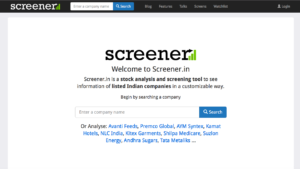 How to use screener website for stock research in India? Click on screens on top menu bar. Select the suitable screen according to your preference. For example, if you want to investigate companies with a good quarterly growth, select ‘The Bull Cartel’. 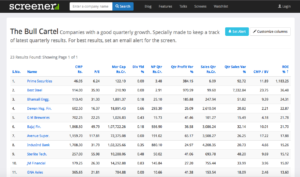 Navigate through the list and investigate the stocks. Screener also gives you a facility of Query Builder, where you can customize the query according to your preference. We will discuss more how to write a query in Screener in another post. 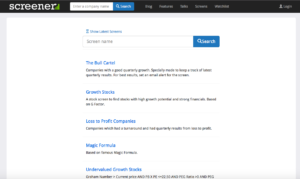 Using the screens on the Screener website, you can undergo the stock research in India. Further, the different screens help the investors to investigate different stocks based on their choice. That’s all for this post. 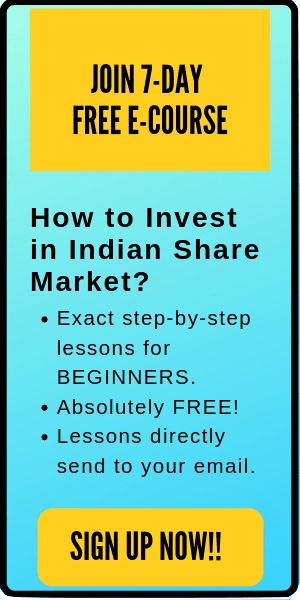 I hope these simple tricks for stock research in India is helpful to the readers. Please comment below if you have any doubts. Happy Investing! !